Dramatic shapes are emerging from the new canal at Capel’s Mill, Stroud. The temporary installations form part of the May Stroud Site Festival. 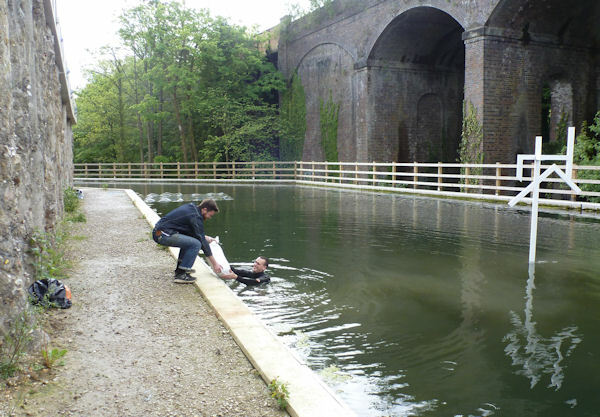 Three London-based artists have created three sculptures sitting IN the canal. 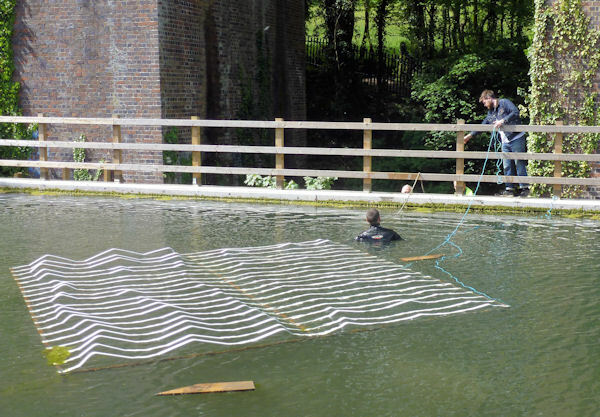 Rob Chavasse has created a subtle painted steel framework representing a cross section of water which interacts and blends with the canal’s surface. Lewis Teague Wright's work comprises three waney edged and routed timber planks jutting vertically out of the water. Ben Sansbury has made an 8’ high wooden framework with a subtle humanesque anthropomorphic quality. Ben explains “I grew up near a canal which was mainly used by industry. That inspired me to make something out of a material that would have been carried on the canal here, but symbolising its future now that it has been restored. Lewis Teague Wright comments, “I was inspired by this fantastic location. There are so many materials and colours. The site's history also makes it’s quite challenging. The sculptures are part of the annual Stroud Site Festival, which is now in its 18th year. The Festival brings a full and dynamic programme of visual arts, performance, music, screenings, open studios, artist talks and workshops to the Stroud Valleys for the whole of this month. The three temporary installations will be joined at the end of the month by a more permanent sculpture to be sited on the high ground in Stroud's new waterside park. The piece is currently being fabricated by local sculptor Sam Freeman at Pangolin Editions of Chalford. Sam won the recent Search for a Sculptor competition generously sponsored by the company.